I’ve talked a lot about various things related to ecology, and even put it in the website name, but I haven’t gotten too much into the nitty-gritty of the science itself on this blog yet. Well, dear reader, you’re in luck! Today I’m going to talk about Trophic Levels. “What are trophic levels?” you ask, because you didn’t bother to click the link. I’ll break it down for you. Ecologies, from the deepest ocean depths to the highest mountain treelines, and everywhere in between, are all based on energy. Energy harnessed into the ecology, how it makes its’ way around the food web/chain and environment, and ultimately how it leaves the ecology. Trophic levels are the different basic levels of the food chain, based on the flow of that energy into the system. For the purposes of building ecologies for your campaign setting, you can think of them as similar to a wizard’s spell levels, with each level having “slots” for various organisms. Now, these are not hard and fast levels or slots when it comes to the living things you put in there. (Deer have been known to eat birds, for example) But they’re certainly good enough for our purposes of building a world. So, let’s take a look at the different levels. Primary producers (at Trophic Level 1) are the forms of life that bring energy INTO a system. The easiest example would be plants, that bring in food from sunlight, but it can also be from anywhere you could feasibly reliably draw energy from: low-level radioactive ore, the heat and chemical energy from thermal vents along the ocean floor (each of which is so separate they often have their own unique little ecosystems and whole species who can live just around that one set of vents), etc. It doesn’t even have to be plants. Remember, this is a guide for where ORGANISMS fit in the ecosystem, and how energy flows through it. It doesn’t matter what those organisms or energy sources ARE. Basically: If it turns non-organic stuff into food, it’s a Primary producer. Primary consumers (at Trophic Level 2) are the forms of life that eat the primary producers. Bet you never thought of a cow as a predator before, huh? They take the energy from the producers and use it themselves, insert Hollywood joke here, moving it further through the system. They can’t make all the complex chemicals that the producers can, because they simply just take those chemicals from the producers themselves. Secondary Consumers are to Primary Consumers what the Primary Consumers are to the Primary Producers. They eat them. One thing to keep in mind is that this doesn’t necessarily mean they kill them. Biting flies and the like would be one simple way you could have a secondary consumer while leaving the primary consumer alive. However, around here we start to reach an interesting phenomena. Actually, a couple. See, while each level gets its energy from the level directly below it, some of that energy is lost due to simply living, or the process of digesting, or what-have-you. Ultimately, only about 10% makes it up each level. And that’s for each level. Primary Consumers live off of about 10% of the energy that was in the Primary Producers. Secondary Consumers live off of about 10% of the energy that was in the Primary Consumers. Etc. It’s not a perfectly efficient system. This means that you need about 10x the amount of biomass of level 2 within level 1, because level 2 needs to eat 10x more to sustain itself. Same with the other levels. Each level you go up, you divide the total biomass in the level below by 10 to find out how much biomass you have to work with that can actually be sustained by the system. If, for example, every species had the exact same amount of biomass, you’d need 10 plant species before you could have a single herbivore. Fortunately for the sake of spending our creative energy efficiently, not all species DO have the same amount of biomass. A few plant species can be so successful that they can support many other animals all on their own. But we need to keep those numbers in mind when we’re describing the world. The wild plantlife is like the farmer’s crops: it takes whole fields to feed people. A world barren of producers will be barren of consumers as well. That’s why a lot of deserts are actually filled with plants, despite the common idea. The other problem we run into with the low efficiency between trophic levels is one of poisons. Those few substances in regular abundance that bodies can’t naturally process out, or at least do so very slowly, wind up being concentrated more and more the higher up the chain they go, since each level winds up eating (over their lifetimes) quite a few times their own bodyweight in the level below. That covered, let’s go back a bit. There was one group which I left out in my earlier description of Trophic levels. The Decomposers, the organisms that break down other dead or decaying organisms. Without them, energy would simply shoot straight through the system and out the other end, resulting in a lot of wasted potential. Instead, the decomposers help recycle the energy that would otherwise be lost in dead organisms back into the system. They’re also the reason we’re not up to our neck in dead things. 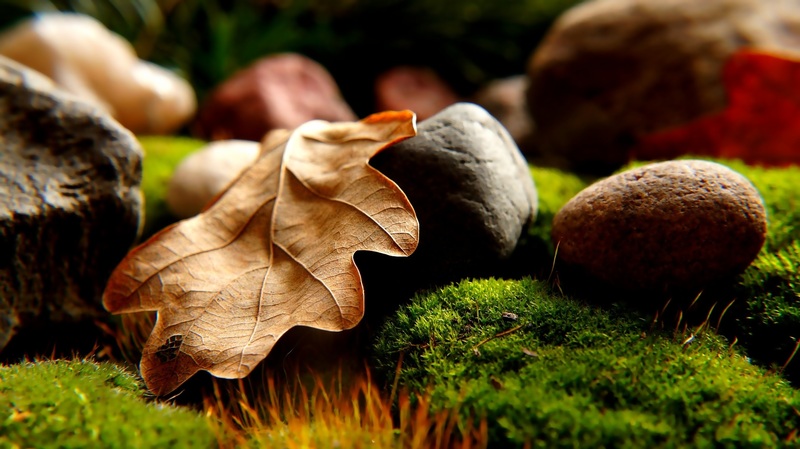 All that matter has to go somewhere, may as well go into the soil or back into the system. With all of that in mind, let’s look at how you can use this to make a rough food chain for your dungeon, forest, city, etc. Let’s put, for very rough starters, 5 slots for the Primary Producers, 3 for the Primary Consumers, and then leave 1 slot open for a predator as a Secondary Consumer. After that, include 1 or 2 Decomposers (and perhaps a carrion-eater or scavenger if you like), to recycle that energy back into the system in some way. This should mean that (if I’m doing math right, that is) each Primary Producer species needs to have on average 6 times more biomass, species-wide, than each Primary Consumer. Primary Consumers, on the other hand, need to have on average 3 times more biomass species-wide than the single Secondary Consumer. I mostly do this because I know that most people don’t like to spend time coming up with 100 plants to be able to do 1 predator. And do keep in mind that I’m talking species-wide here. You can have a giant super-predator. There just has to be VERY FEW of them in an ecosystem LARGE enough that the level just below them can support their massive bulk. If they grow too large in size or number, or the ecosystem grows too small, they’ll face trouble. So, there you go! A simple little “fill in the blank” guideline for building your own little mini-ecology! It’s not perfectly accurate, but hey, it’s better than nothing! And for those balking at coming up with 5 producer species, don’t worry about it, you can have them still be useful to the party by giving them either poisonous or medicinal properties. Or have them be stuff the players themselves can eat as well. Just remember to keep in mind how energy is flowing into the system, any ways that energy can flow out of the system, and how each of the levels relates to one another. Don’t be afraid to add in more species, just keep the number higher towards the bottom of the pyramid. And don’t throw random giant dragons into a desert without thinking about where all their food comes from. We do not have 5 senses. We don’t really know for sure how many we do have. We mostly just think of it as the way bats, whales, and dolphins see the world, forming a sort of “radar” image in their heads of just the general outline of where everything is. You may picture it like just being able to “see” except everything’s the exact same color, if you even stop to consider it at all. Indeed, that’s how a lot of people treat it. A blind man’s version of sight. But it’s so much more. Echolocation doesn’t just show you your surroundings. For certain species, it can show them what’s inside of their surroundings as well. Ever hit a wall or door or box to see if there was something on the other side or if it was hollow? Same basic principle. With a strong enough sound, and precise enough hearing, some animals that use echolocation can actually get a sense of where your bones and organs are inside of you. Now imagine a creature like that using that knowledge for precisely aiming their blows. Admittedly, I don’t believe it goes very deep at all (it’s surprisingly hard to find info on the level of detail Dolphins get from this). But this would also let them have a very different mental picture of what their surroundings are supposed to “look” like, than most everything that DOESN’T have echolocation. What looks hidden to you or me may seem different to a dolphin or bat. Unless you happen to be good enough at echolocation yourself. Yes, that’s right, humans can learn echolocation. There are even websites devoted to teaching the blind and visually impaired to see using sound. Made with the help of blind people who have hobbies like basketball and mountain biking. Now, granted, you won’t be nearly as good at it as bats, dolphins, whales, etc, and probably won’t be able to do some of the things they can with it. But with enough practice, it is entirely possible for humans to learn. Which means it’s possible for really creative and dedicated NPCs to have learned. Going the extreme route with that, you can do a little research on echolocation and the physiology of species that rely on it to create realistically designed eyeless beasts and monsters that hunt while sounding like the Predator. There are limits to it, too. In the same way you can’t see when it’s way too bright out, really loud noises can drown out echolocation. But even more uniquely, because reflecting sound in one direction is easier than light, you can also make things harder or easier to spot simply by if they’re facing one way or tilted another. All in all, I think it’s something that deserves a mention when we talk about senses. Different animals process the information about the world around them in very different ways, and they may seem strange or even alien to us, but that’s honestly what I love about them. There’s even a term for that: Umwelt. But that’s probably best delved into in a later post someday. So, remember a little while ago when I posted about a whole bookload of pawns for the Tome of Beasts, made by Kobold Press? Well, they (or at least Wolfgang Baur) recently made a podcast with the folks at Wizards of the Coast, talking about how their original Tome (before the pawns) was so well received that they’re working on creating a second book! They also talk about Dinosaurs, people, Dinosaur-people, and a little bit about the history of Dinosaurs in D&D. As a big fan of various creatures and beasts and creative monsters found in tabletop rpgs, as well as a big fan of Kobold Press themselves (which I’ve said before), as well as Dinosaurs in general, I’m looking forward to this. So, with that last article about how plants (and, come to think of it, animal parts) could be used for various substitutions for potions or poisons or whatever you care to think of, I figure now would be a good time to start talking about some real-life plants that can either serve as inspiration for death and mayhem, or provide it all themselves. And I’m not talking hallucinogenics, either. We’re talking trees that reproduce by ballistics, migrate along the forest floor, meat-eating shrubbery, etc. But I’ll save those for later entries. Yes, the Eucalyptus tree, that thing the Koalas eat. Today, we’re going to talk about how a simple tree commits war crimes on the surrounding environment to thin out the competition. What kinds of war crimes, you may ask? Suffice it to say that forests of this simple tree genus (a member of the myrtle family, Myrtaceae) can turn a gentle countryside of the normal everyday horrors associated with the southern continent into a raging hellscape the likes of which even California would think is a bit too much. They also produce a high amount of litter (dead leaves/twigs/bark/etc on the ground), which doesn’t degrade that easily, covering the forest floor with large amounts of dry, combustible tinder to match with the fuel filling the air. The bark of some species hangs in long thin (easily lit) strips loosely from the trunk. These trees burn their competition (and themselves) alive because they can survive a fire better than their neighbors, or simply regrow afterwards better than anyone else. Their oil is so combustible that ignited trees have been known to explode, and the fire travels easily through the air-rich tree crown filled with oil-soaked leaves and fuel mist, as well as across the piles of tinder these things leave everywhere around them, sending burning embers flying far and wide. Where do the Koalas go? Honestly, I don’t know, but now I’m picturing were-fire-elemental Koalas and it’s both adorable and terrifying at the same time. If you ever wanted to experienced the Plane of Elemental Fire but didn’t like the price those fancy wizards were charging for their Plane Shift spell, just put a volcano near a forest of these and have the elementals come to your players for a change. If that weren’t enough to make them the blasted charcoal growths of the pit, some species also have been known to drop their heavy branches unexpectedly (even when not on or near fire), possibly injuring or killing people camping underneath. There’s a long history to using the natural plants and fungi around us to treat wounds, illness, poisons, and even cause various other effects. So much so, that I honestly kind of regret the whole “cure disease” spells or cure-all medicines common in fantasy and scifi rpgs. Sure, it simplifies things, but I honestly think it kind of misses a huge opportunity for immersion, where the very setting itself plays more of a role other than that of combat. Heck, even leaving diseases aside, plants are basically the proto-pill, drugs growing out of the dirt with all sorts of unexpected uses or effects just waiting to be discovered or learned. You could probably replace a lot of spells or scifi-nano-shots or serums with a simple extremely rare but highly useful plant. The rarity lets you set the price, so running into a meadow or forest of the plant can feel like a goldmine, while the difficulty in keeping said plants alive or harvesting the drug from them in the first place can act as a control on abuse or a creative puzzle for the players to engage with! After all, if there’s tons of magical/fantastic or otherwise unusual alien beasts around, makes sense that there’d be magical/fantastic or otherwise unusual alien plants around, too. “Medicinal plant tea which grants increased strength for X time after drinking” makes for a simple but interesting twist on the whole “Potion of Giant Strength” bit, and makes it seem like something the players themselves could actually learn the secrets of if you’re willing to let them and they put in the work. And it gets even better when you consider other ways it might replace the typical uses of magic in a setting. Those old hedge wizard studies become suddenly easier to picture, you can almost smell the heavy scent of fifty different plants, and preparations. Books of lost lore could describe the mythical uses and ways of preparing unusual or long-forgotten plants, and maybe even where to find them! You ever wonder about some of the crazy, weird, and in many cases just plain dumb-looking monsters we sometimes see in our Beastiaries? You ever have your players call foul on some creature you’ve cooked up? You ever want to just weird your players out? Then sit back and let me tell you of some of the stranger things our world has to offer. After all, no matter how well traveled you may be, there’s always something weird and wonderful just over that next horizon. Like the Saiga Antelope. Yes, we’re starting with weird. No, that’s not a trick of the camera. These creatures actually exist, and are critically endangered. I’m not really sure what all to write about them, to be honest. 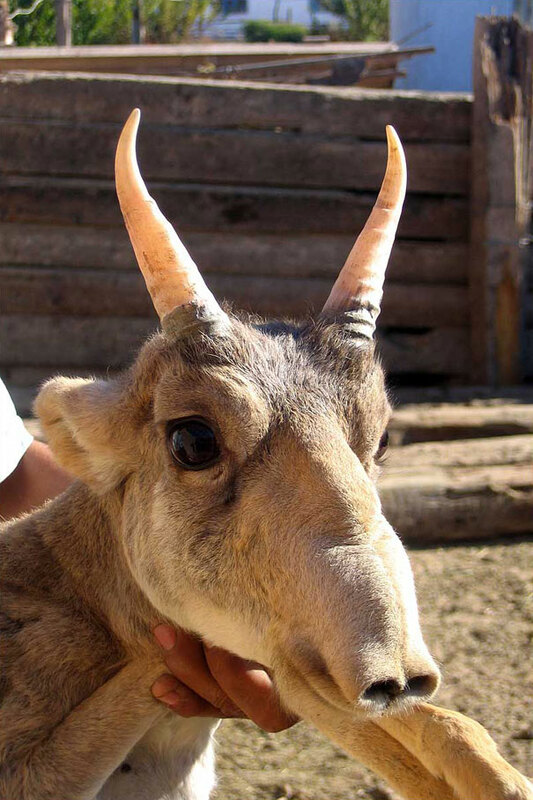 They look like some made up Star Wars combination of a normal antelope that had its muzzle deflated to form one of the most unexpected nose designs I’ve run across. Or like someone played “got your nose” and then never returned it. These guys are proof that just about any small-but-weird change can work as a plausible species, if you can justify it well enough. After all, do vampires have eyebrows this amazing? No, no they do not. Those are anime-quality eyebrows right there. 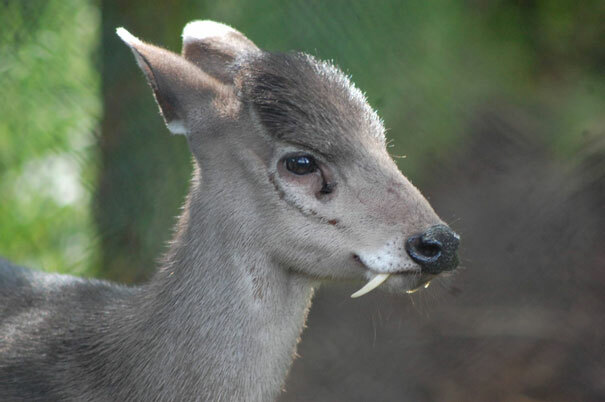 Despite the fangs and amazing eyebrows, though, they are very timid toward humans and prefer to live in places with good cover. In fact, “It can be easily disturbed and, when alarmed, it will let out a bark before fleeing, moving in cat-like jumps.” Which probably means that your players wouldn’t see very much of it, adding to the allure and otherworldly-ness of whatever misty forest they managed to glimpse the animal in. 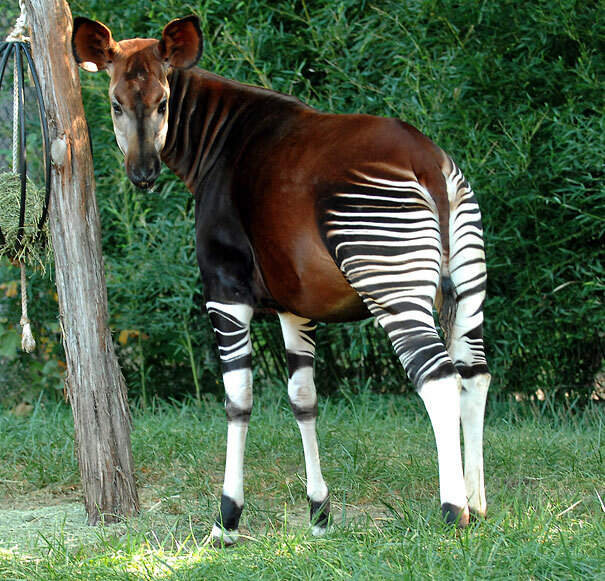 Lastly, I’ll leave you with the Okapi, which you may already be familiar with. A relative of the giraffe, it looks more like part of a zebra. 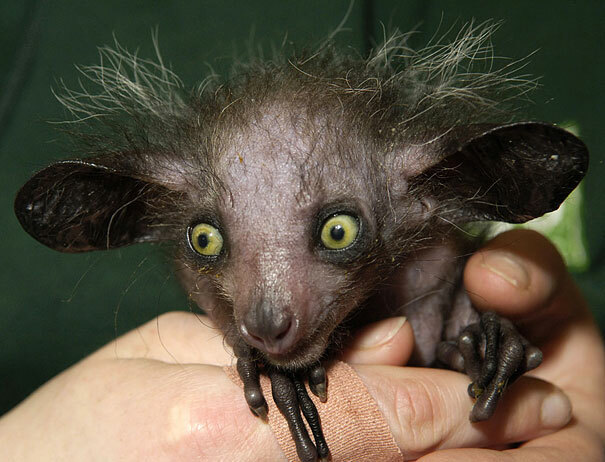 I could have shared a bunch of even crazier stuff (like the Aye-Aye and their freakish hands), but believe it or not I had a point to all this. It doesn’t take much to make something new for your world, or even just a section of it. Having things that look similar to but unmistakably different from other known animals can be a simple but profound way of setting a particular geographical region or an entire world apart. So if you’re ever feeling not very creative, and the best you can come up with is a giant vampire frog, well, that’s still perfectly in line with the weirdness of nature! And if your players don’t buy it, you can now show them actual pictures, too. Also, I’m currently working on an example animal that you guys can use to add a nice little flair or curiosity to your worlds. I hope to have it out soon, but in the meantime, remember that Corgis were believed to be the preferred riding mount of fairies. Now picture the Wild Hunt with that in mind. You’re welshcome. Start with the environment first, and then adapt the wildlife to fit. This works really well when you start off with an environment that is, itself, somewhat unique or dangerous to everything living there, while not being an absolute death sentence. The ideal being just enough to put anyone travelling through on edge or grab their attention. Let’s take, for example, one of my favorite settings (even if I could go on a long rant about the story it got), Zendikar. 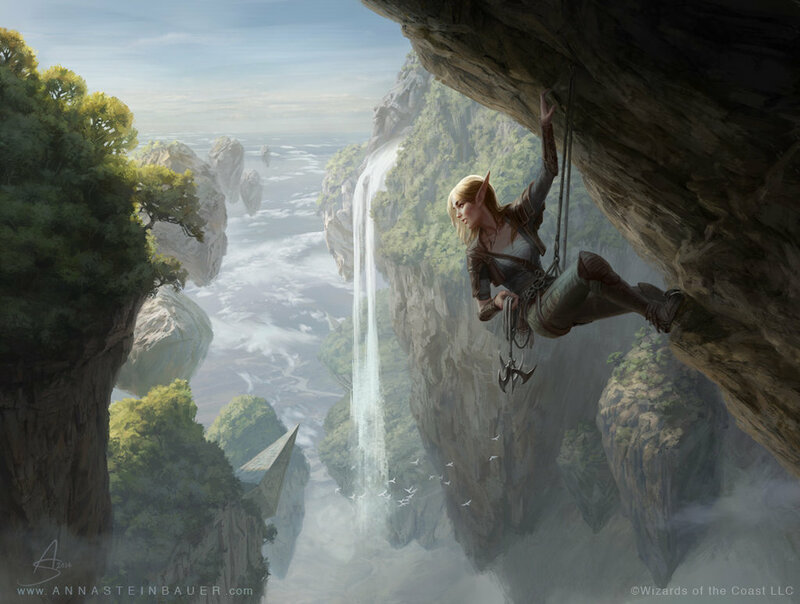 For those not in the know, Zendikar is a setting (more specifically, a plane of existence) filled with vibrant and lush wildlife and impossible gravity-defying geology. Rocks hanging in midair are par for the course. But the key facet about Zendikar is the “weather” phenomena known as the Roil. How do I sum up the Roil? Imagine if the land beneath your feet and the vegetation that grew there changed as easily and swiftly as the weather in the sky. This makes the land interesting, dangerous, constantly new, and keeps it from being subsumed in local cities or townships. Ruins dot the landscape, being revealed and hidden away like wrecks in the surf. Forests wash over what was once mountains, and the next day it could be a lake. Different areas are affected more or less frequently, but there is no escaping it. Mapmakers have never had such good job security. EVERY horizon could be a new one, even those you just walked over last month. So, here comes the question: How does the wildlife adapt? Well, there are a couple ways to adapt to any threat. Avoid it, beat it, or become immune to it. The birds of Zendikar take advantage of the floating rocks and debris about the plane as semi-stable nesting sites, and some can live their whole lives never touching the ground once. The creatures known as Baloths (think a combination of a bear, a bull elephant, and a Barbarian with unlimited Rage capabilities) grew tough enough to withstand the voilent changes themselves, while being strong enough to leap through the trees and take down prey. Their diet grew wide enough so they can effectively act as a sort of predatory scavenger, eating just about anything they can catch, which is most things. There are other general ways to adapt to threats, which I won’t go into here, but by and large most of the wildlife on Zendikar has been required, simply by where they live, to be either able to adapt and thrive in violently-changing settings, or to be able to avoid or ignore said violent changes in the first place. So, that in mind, what sorts of general risks or threats could your own settings have? How would the birds, beasts, the herbivores and the insects, the plants and the fungi, all survive those threats? How could they adapt, from the general concepts we have for them now, to be better suited to live out their normal lives in that environment? Maybe they’re good with camouflage, maybe some have thick hides/fur/armor/scales/feathers/etc, maybe others simply know when and where to not be around or have some protective home they create. Maybe they take advantage of another species’ defenses against the threats. Maybe they can even turn the disadvantages of their environment to their favor! The setting your wildlife lives in can be just as useful a tool as any in your belt. Don’t be afraid to cut loose with it sometimes. Oh, and for those interested, you can even get the info needed to run the Zendikar setting for D&D 5E. Try it, and let me know what you think! The Strid. Probably the most dangerous stretch of water in the world. It doesn’t look dangerous at all, but that’s exactly what makes things like ninjas, poisonous mushrooms, and [insert pop culture joke here] such a threat. The Saltstraumen Tidal current. Tides on their own don’t normally come to mind when we think of powerful forces of nature. Only when a river floods its banks, or a hurricane sweeps through the area, or maybe if a dam breaks, do we really worry about having too much water. But tweak the geology just right, and you can wind up with seriously impressive amounts of water moving in a very noticeable way. While impressive in their own rights, don’t forget that you can push this even farther in your own worlds. Make the forces that affect them larger, the sheer volume greater, the speed faster, etc. Just imagine how certain animals and plants might adapt to this sort of environment, or maybe even make it more dangerous without meaning to. Here’s a few neat props to help your games go better, or at least to impress your players when they visit. Fair warning, both stray a little further than I normally want to go with this blog on the “creature/monster” scale. Seems pretty cool. What hunter hasn’t wanted to mount the head of some strange beast on the local tavern wall? And if you’re going to have your players fight some strange beast, you’ll probably need props for that, too. I love, love, love Kobold Press. They do amazing things, and when they set their minds to flesh out an ecosystem it’s almost a sure thing that it’ll be one of my favorites. Someday I’ll probably devote whole posts just raving about a single one of their books. 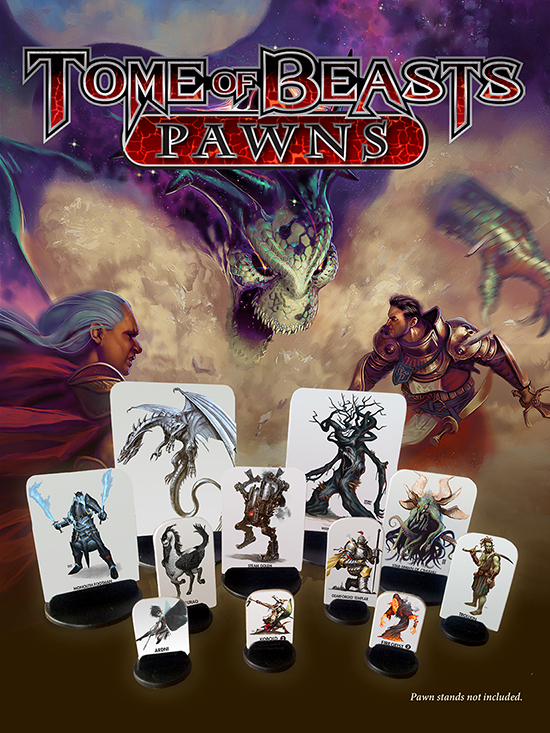 But in the meantime, how’s 300 different beast, creature, and monster pawns sound to you? That’s all I really got for now. Happy gaming!